The venom of this snake is potentially dangerous to humans. Adults are 30 - 65 inches in length ( 76 - 165 cm) typically 2 - 4.5 feet long. Young about 12 inches long. A heavy-bodied, venomous pit viper, with a thin neck and a large triangular head. Pupils are elliptical. Scales are keeled. Variable in ground color; pink, reddish-tan, reddish-brown or brick red. Diamond-shaped blotches, usually with light edges, mark the back. Juveniles are duller in coloring than adults. The underside is usually dull yellow and unmarked. Black and white rings surround a thick tail. A rattle, consisting of loose interlocking segments, usually occurs at the end of the tail. A new rattle segment is added each time the skin is shed. Newborn snakes do not have a rattle - just a single button which does not make a sound. Similar to and easily confused with the Western Diamond-backed Rattlesnake, but in California the ranges of these two snakes barely meet, and the Western Diamond-backed Rattlesnake in Calfornia does not typically show a red color phase. Heat sensing pits on the sides of the head help the snake to locate prey by their warmth. Long, hollow, movable fangs connected to venom glands inject a very toxic venom which quickly immobilize prey. The snake can control the amount of venom injected and the fangs are replaced if broken. Bites on humans are potentially dangerous without immediate medical treatment. Even a dead snake can bite and inject venom if the jaws reflexively open when they are touched. Primarily nocturnal and crepuscular during periods of excessive daytime heat, but also active during daylight when the temperature is more moderate or when in the comparatively cooler shaded areas of boulder fields. Not active during cooler periods in Winter. Terrestrial, but may partially climb shrubs or trees. Prey is found when actively moving, or by ambush, where the snake waits near lizard or rodent trails, striking at and releasing passing prey. The snake then follows the trail of the envenomated animal and swallows it whole. 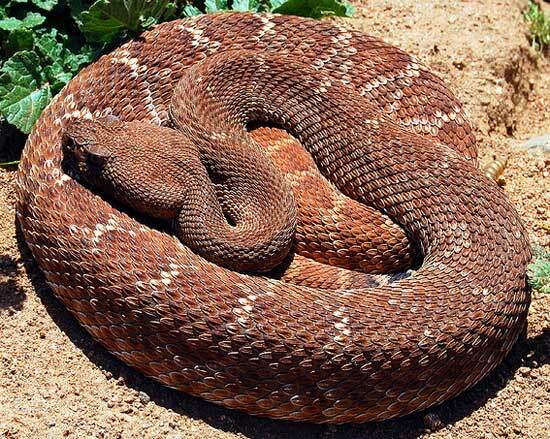 When alarmed, a rattlesnake shakes its tail back and forth. The movement rubs the rattle segments together producing a buzzing sound which serves as a warning. Juveniles are born with only a silent button at the end of the tail. Live-bearing; young born July - September. Male to male combat occurs. Inhabits arid scrub, coastal chaparral, oak and pine woodlands, rocky grassland, cultivated areas. On the desert slopes of the mountains, it ranges into rocky desert flats. Previously recognized as a subspecies of Crotalus ruber: Crotalus ruber ruber. 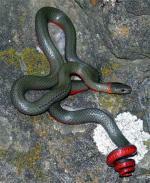 Some taxonomists regard this snake as a subspecies of Crotalus exsul labelling it Crotalus exsul ruber.